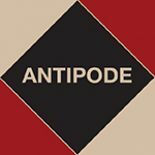 What follows is a report of the activities carried out with the invaluable contributions of the Antipode Foundation International Workshop Awards. 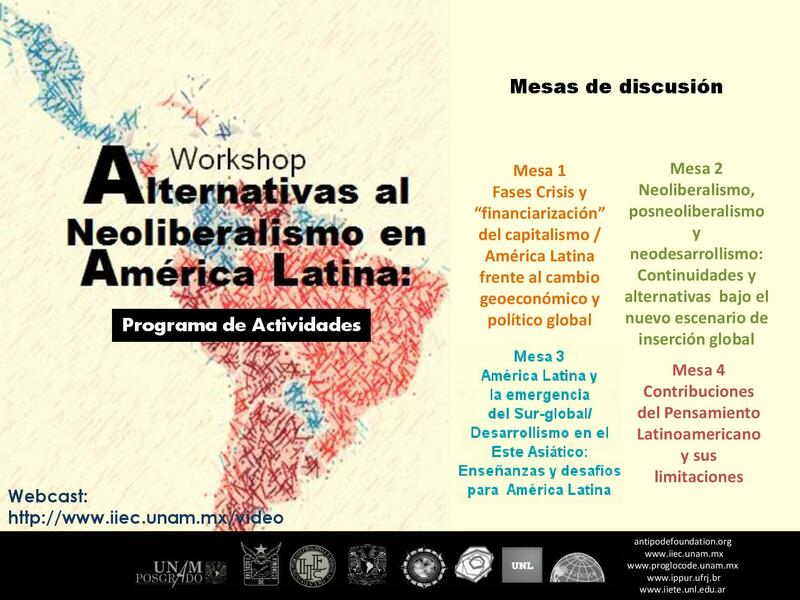 The main activity funded was a workshop named “Re-thinking Latin America Development Beyond Neoliberalism: Toward a Rediscovering-Recreation of the Latino American Thought on Development”. It was carried out at Universidad Nacional Autónoma de México, México City, from March 25th to 27th, 2015; and coordinated by the Globalization, Knowledge and Development Program (Programa Globalización Conocimiento y Desarrollo; PROGLOCODE), Sergio Ordóñez (Universidad Nacional Autónoma de México, México), Víctor Ramiro Fernández (Universidad Nacional del Litoral, Argentina), and Carlos Brandão (Universidade Federal do Rio de Janeiro, Brazil). The 35 papers presented were organized in five main issues: 1.Phases, crises and financialization of capitalism. Latin America confronting the global geoeconomical and political change; 2. Neoliberalism, postneoliberalism and neo-developmentalism: continuities and alternatives under the new scenario of Latin America global integration; 3. Latin America and the emergence of the Global South. Developmentalism in East Asia: lessons and challenges for Latin America; 4. Contributions from Latin American thought and its limitations; and 5. PhD and MA students’ papers. Researchers: Alejandro Dabat (IIEc-UNAM, México); Óscar Ugarteche (IIEc-UNAM, México); Sergio Ordoñez (IIEc-UNAM, México); Sebastián Sztulwark (UNGS, Argentina); Leonard Mertens (OIT, México); Martin Schorr (CONICET, Argentina); Alicia Puyana (FLACSO, México); Carolina Lauxmann (CONICET, Argentina); Víctor Ramiro Fernández (CONICET, Argentina); Marcos Barcellos (IPPUR-UFRJ, Brasil); Carlos Sánchez (IIEc-UNAM, México); Carlos Medeiros (IE-UFRJ, Brasil); Hipólita Siqueira (IPPUR-UFRJ, Brasil); Cristhian Berndt (University of Zürich, Switzerland); Augusto Barrera (FLACSO, Ecuador); Ricardo Bielschowsky (IE-UFRJ, Brasil); Alejandro Casalis (FLACSO, Argentina); Matari Pierre (FCPyS-UNAM, México); Luis Riffo (ILPES-ECLAC, Chile); Eduardo Pinto (IE-UFRJ, Brasil); Sergio Martínez Rivera (UNAM-CECHIMEX, México); Monica Gambrill (UNAM-CISAN, México); Valéria Ribeiro (IPPUR-UFRJ, Brasil); Carlos Brandão (IPPUR-UFRJ, Brasil); Arturo Guillén Romo (UAM-UnidadIztapalapa, México); Blanca Rebeca Ramírez Velázquez (UAM, D.F., México); María del Carmen del Valle Rivera (IIEc-UNAM, México); Ismael Núñez (IIEc-UNAM, México); Javier Jasso (FCyA-UNAM, México); Gabriel Palma (Faculty of Economics-University of Cambridge, UK); Matthias Ebenau (Sindical Beverungen of the IG Metall). PhD and MA students: Paulo Leal (FE-UNAM, México); Jennifer Alvarado (ECLAC, México); Santiago Juncal (UNGS, Buenos Aires); José Montoya FE-UNAM, México); Saira Barrera (UCA-DE, El Salvador); Paty Montiel (FE-UNAM, México). 5. An approach in terms of development and state action is incomplete if it does not consider the spatial dimension of socio-economical processes, which involves a rethinking of Latin American national and macro-regional spaces in a multiscalar perspective, within the framework of local-regional and supranational dynamics, as well as the geoeconomical-political changes of contemporary capitalism. The main result of the workshop was the formation of the academic social network “Latin American Socioeconomic Spatial Development Network” (REDSLA), integrated by both the academic participants of the workshop and new academics. The network was articulated around the four thematic axes that guided the discussions at the workshop. In 2016 REDSLA applied to the Consejo Latinoamericano de Ciencias Sociales (CLACSO: VIII Convocatoria Para La Conformación De Grupos De Trabajo CLASCO 2016-2019), in order to give a more transcendental and organic form to its discussion program; REDSLA was awarded with the CLACSO Working Group recognition. The “Development, Space and Global Capitalism” Working Group, consists of five working subgroups: 1. Latin America and the global geoeconomical and political change; 2. State, development and post-neoliberalism; 3. Latin America and the emergence of the Global South; 4. Contributions and revaluation of Latin American thought; and 5. Territorial and urban problems in Latin America within global capitalism. The Working Group is constituted by more than 70 academics (researchers, PhDs and MA students) of several disciplines (economy, political science and geography) belonging to eight countries (Mexico, Brazil, Argentina, Ecuador, El Salvador, France, Switzerland and Germany), and we are currently constructing a website (http://www.redseela.com), funded with part of the Antipode Foundation resources awarded to us.